We're going to perform at the Summerfolk Festival 2018 in Owen Sound! In January we went up to the Owen Sound for the showcase organized for the Artistic Director of the Summerfolk Festival and ... we got selected to perform at the Festival! We are super excited especially that we might be the first Polish group that ever performed there! Wanna come to check the festival and see perform? There are still early bird tickets available! Polish folk music - the multicultural way! You can listen now to the interview with Matti, Tristan and Ewelina in the newest episode of POLcast which is the Polish podcast about Poland, all in English! 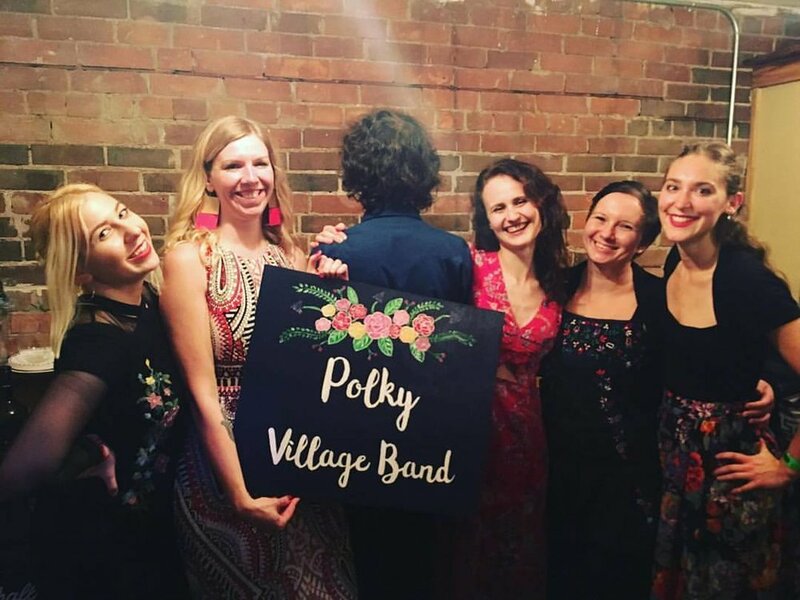 Polky Village Band's acoustic show at the Lemon Bucket Orkestra CD release! Our band is gonna play acoustic show at the Lemon Bucket Orkestra CD release party! Come to the event and catch our acoustic performance in the lobby of the Danforth Music Hall in Toronto on November 4th! Lemon Bucket Orkestra "If I Had The Strength" Album Release! 19+ Event/Valid Photo ID Required! Join us on November 4th at the Danforth Music Hall for our official record release party for "If I Had The Strength" - an event not to be missed! Two years in the making, the album once again draws its repertoire from folk traditions and styles from across Eastern Europe. But unlike our two previous albums (2015’s Moorka and 2012’s Lume, Lume), which were both just collections of individual songs, "If I Had The Strength" explores a singular narrative line to tell a much bigger story. "If I Had the Strength" is an album about coming home, about never being the same, about the parts of ourselves we lose, the parts we gain, and about the prisons we inhabit or that inhabit us,” says LBO ringleader, Mark Marczyk. With IIHTS, we have created a song cycle inspired by a century old Slavic prison ballad that tells the story of a young rebel coming home after laying it all on the line. The work draws emotional weight from our band members' personal experiences with the Ukraine-Russia conflict, but it also highlights our dozen strong ensemble's party-punk roots and attitude, developed and honed while busking on the streets of Toronto and around the world. The new album also features a compelling list of unexpected guests; from beloved Canadian soprano, Measha Brueggergosman, to Montreal-based Latino rapper, Boogát, to a triumphant-yet-tragic 60 strong reading of the late Adrienne Cooper's Sholem by the mighty CHOIR CHOIR CHOIR Weaving in and out of the prison ballad theme, the work takes listeners on an emotional journey exploring trauma and tragedy through the lens of musical exploration and communal celebration. We look forward to sharing this experience with you all! October started for us with exciting news! We signed a contract with Marilyn Gilbert Artist Agency and we are now on her roster of incredible bands and musicians! Marilyn has been working in the industry for almost 40 years! She currently works with friends of ours Lemon Bucket Orkestra and Gypsy Kumbia Orchestra and Juno 2017 award winners Okavanago African Orchestra as well as the world famous Polish klezmer band Kroke. Ewelina represents Polky at Aga Khan's Nuit Blanche! As a part of #TheBalkanElectroExperiment Ewelina is going to represent Polky Village Band at the Nuit Blanche 2017 at the Aga Khan Museum in Toronto on September, 30 at 3 - 4 am. "While Toronto’s Polish community celebrates up and down Roncy and the Ukrainians take over Bloor West, Hugh’s Room Live brings the vibrancy of Eastern European together with two hot new bands, drawing on their roots". Toronto Ukrainian Festival and Roncesvalles Polish Festival Toronto always happen during the same weekend in September in Toronto's west end in two different locations. Finally Ukrainian and Polish festivals unite under one roof at Hugh's Room Live! Polky Village Band and DoVira, Polish and Ukrainian music, on one stage to close off both festivals.